UK: EDF Energy Renewables has ordered five V164 turbines from MHI Vestas to be used at its Blyth test facility off the northeast English coast. EDF said it would install the five turbines on concrete gravity-base foundations designed and built by the Dutch construction firm Royal Bam Group. 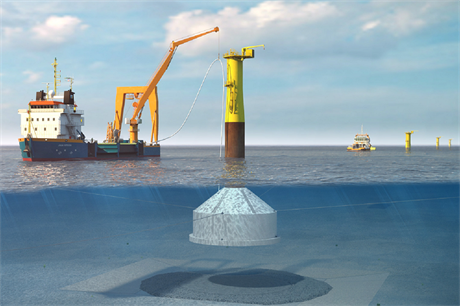 Onshore construction work has already started for the project, with offshore installation expected to take place next year. The foundations will be manufactured on the River Tyne in northeast England, before being floated to the project site for installation. Construction of the Blyth project is set to be completed in 2017, EDF said. The five turbines will be connected to the UK grid via a 66kW cable. EDF said it would be the first project to use 66kW cables, which will become the industry standard as turbines get larger, EDF said. The current cable standard is 33kW. Evidence of turbines becoming larger is shown by MHI Vestas supplying five V164 turbines with an up-rated capacity of 8.3MW – up from the initial 8MW design. The first phase of the Blyth site will therefore be 41.5MW. It is not the first time MHI Vestas has agreed to provide up-rated turbines. In December, the manufacturer won the deal to supply the V164 to the Walney Extension West project for Dong Energy. The 40 turbines at that project will generate 8.25MW. In October 2014, EDF Energy Renewables acquired the rights to the Blyth test site from the seabed landlord, the Crown Estate. The site has the consent to install up to 99.9MW of capacity, meaning just under half will be taken up by the first phase. After acquiring Blyth, EDF said it would use the project to "grow its expertise and experience in designing and choosing foundations" and develop offshore installation processes.